For your convenience, we've also posted each slide transcript for your viewing below. Enjoy! ALKA: Reporting can be time consuming, but not if you have a solid structure for your reports and the tools to automate your reports. Reporting should tell a good story. But that story doesn’t have to be a novel. In today’s presentation we are going to cover some ideas of how to structure a weekly or monthly report in a way that gives you the clearest and easiest to understand snapshot of your accounts performance. 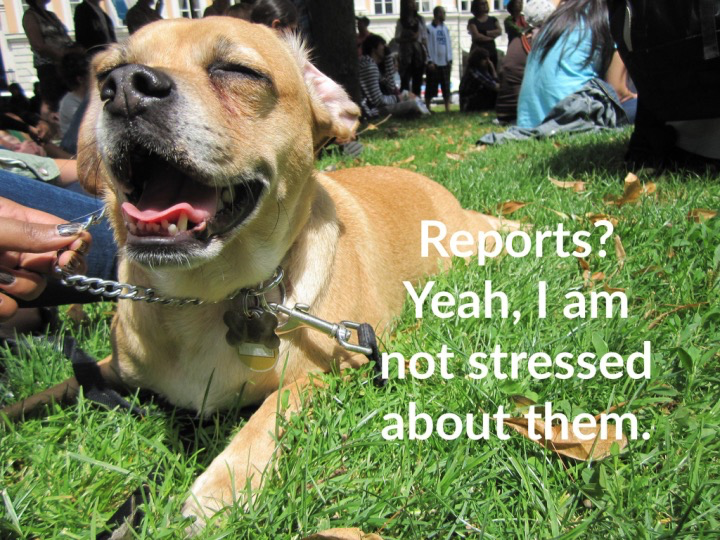 If you have a dozen reports that you use regularly, you might find some peace of mind in consolidating your reporting and we hope to teach you some formats that might help you reduce your reporting clutter. Additionally, we are going to show you a few of our favourite reporting tables and charts, to give you a fresh perspective on your data. ALKA: When all is said and done, we hope to bring you a little more reporting sanity! 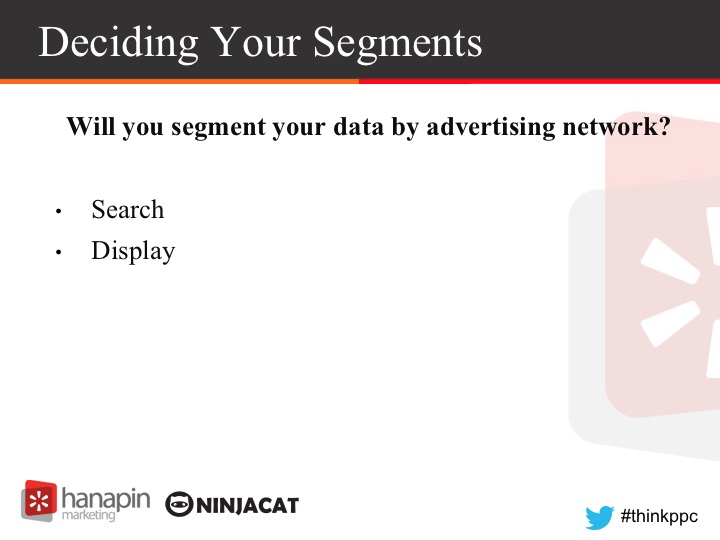 ALKA: One of the primary tips we’ll focus on today is data segmentation. The layout of a report can be confusing, so I like to have a basic theme to my reports depending on the client and their business goals. We will cover four different ways you can splice your data. ROBIN: We’ll also talk about selecting the optimal time frame for your reports, leveraging forecasting tools to stay on track, and ideas for decluttering your reports and making your data story jump from the page. 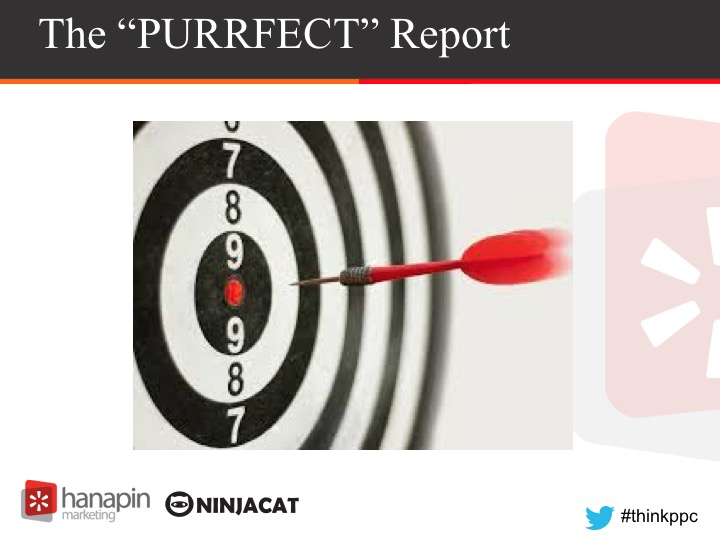 ALKA: Last but not least, we’ll share with you an example of a “perfect” report. 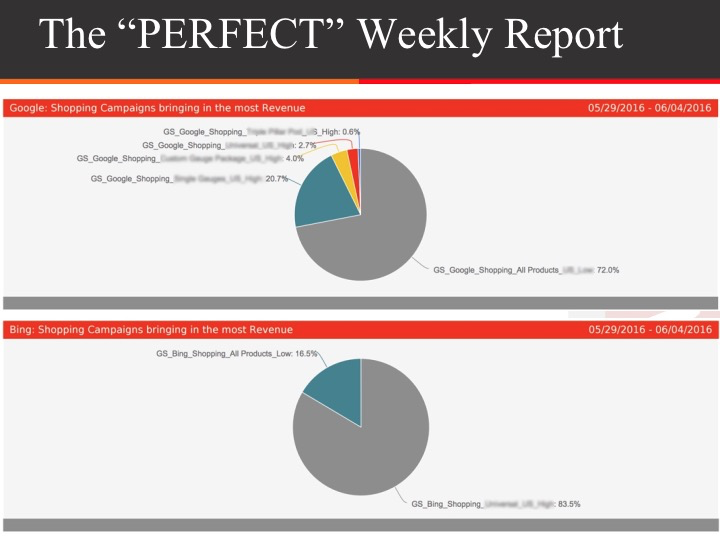 Let’s heavily emphasize the word “perfect”, in reality reporting is very personalized and what you consider a good report will be different from someone else. But hopefully this example will trigger the creative juices for your own reports! 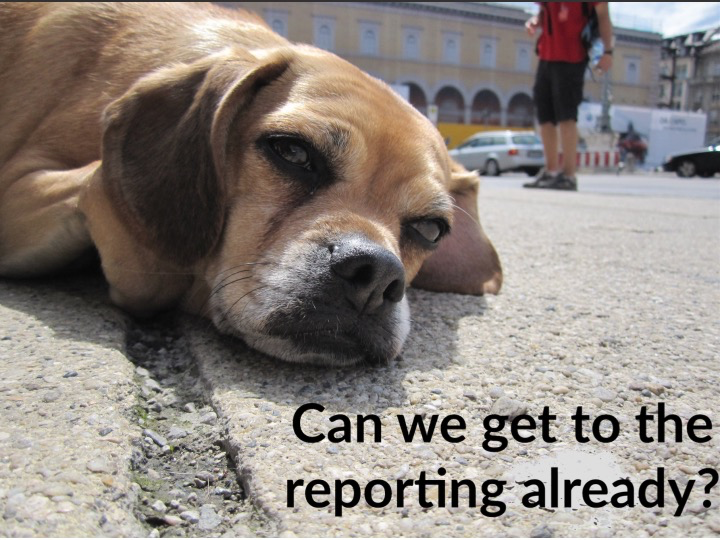 Robin and I are excited to talk to you today about reporting, but we really want to hear your thoughts and questions, even if you want to tell us that our competing dog memes are terrible! 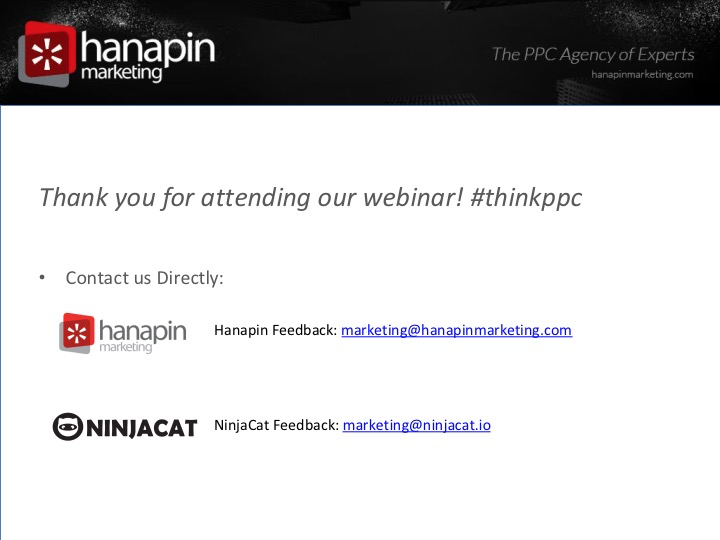 so don’t forget to send us your questions during the webinar through the webinar question box or on Twitter using the hashtag #thinkppc. ALKA: Let’s get started. Actually, before we even think of creating yet another report - we have to answer some basic questions. Starting with: What is the point of this report? If your answer is “to keep an eye on the account”, you might want to take a minute to go a level deeper. Will this report get used as a part of any major decision making? Or will budget be adjusted monthly, quarterly or yearly because of your report? 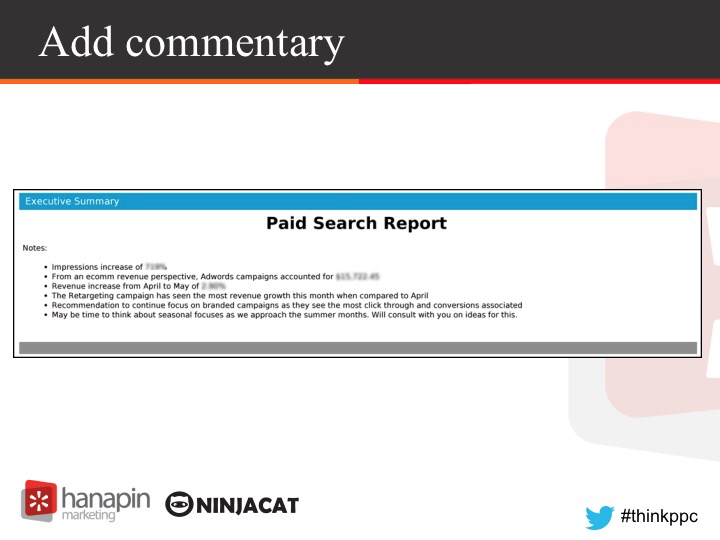 Or will your report determine if ads are phased out or expanded? Or will it help identify marketing trends? 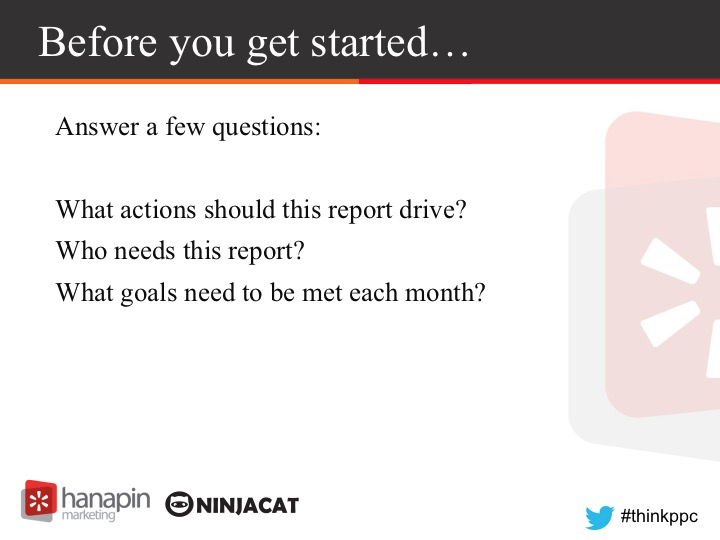 Even if your answers are no to all of these questions, it is still helpful to give your report a purpose because a purpose will help you clear out the clutter of your reports. When you have a point to your report, you will be able to remove components that don’t align with your reports mission statement. Another level of questions to ask is about the audience: Who is the report for and what is the most important information to them? The last thing you want is a report that raises more questions than it answers, so take a minute to think about what questions your audience need answers to on a regular basis. If your report is informative enough, you might even be able to avoid an extra conversation! And who wants to have extra conversation? I certainly don’t! Unless if that conversation is about my dog or Game of Thrones, in which case I have all the time in the world. Lastly, consider who is this report going to be shared with? This will inform you how to change the language of your report and the complexity of the data you will share. An advance question for the all stars out there is: What are the personal/professional goals of the person you are sharing the data with? Let’s be honest, most people only care about their jobs and how this report can make them look good. 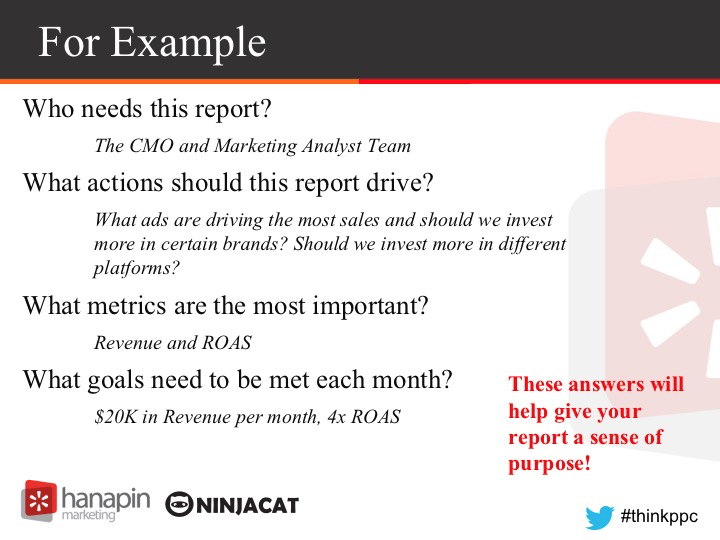 For example, if you are presenting to a CMO, you can look like a real reporting beast if you organize and present data that consistently highlights the metrics that are the most important to that person. And one would expect that the CMO’s top personal goals are in line with the organization but we all know that is sometimes not the case. ROBIN: Excellent points Alka. So much of the time, I work with agencies who are literally chomping at the bit to dive in and start cranking out reports. It can be super challenging to convince them to stop for a moment, and take into consideration everything you’re suggesting. They’re kind of like, “Huh? You want me to put myself in the shoes of the person who will read this report?” It’s not rocket science - it’s a very “back to basic” concept that we forget about. But when they DO take the time to do this, their reports go from ordinary to extraordinary. For example, the mission statement for an ecommerce client report might be to present a weekly report that shows the ROAS of the various paid search platforms. Furthermore, reporting on revenue and spend data to make sure they are going to hit their goals for the end of the month, as well as understanding if they are performing better or worse than the same time period last year. 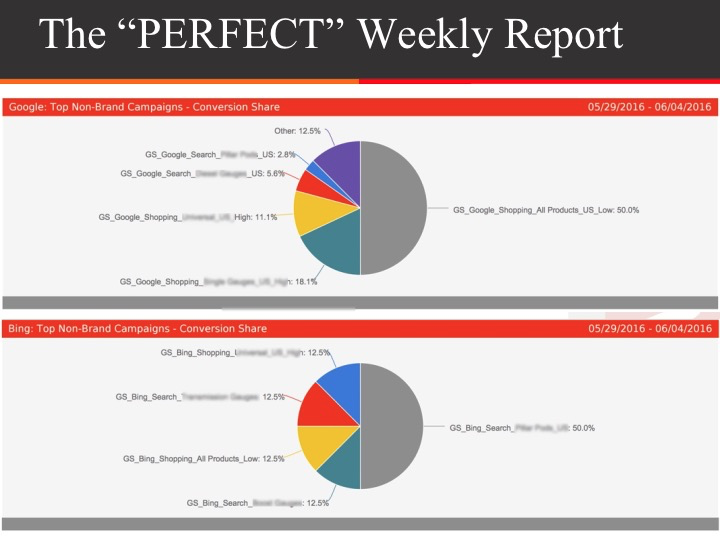 For a weekly report, this is enough information to stay on top of things; whereas a monthly or quarterly report would likely require more details about the campaigns and keywords driving performance. ALKA: I want to take a little detour now and if you are younger than 30, you will not understand this meme but discuss a topic amongst ourselves - the topic is Goals. For those who have questions about what their goals should be, keep in mind that a quantifiable goal is critical. It keeps everyone focused on a target to achieve. The goal should be measurable and attainable! The best starting point is to take 1 or 2 metrics that your client or team talk about often and review the average for those performance indicators over the last 6 months and the last 12 months. If you are in an industry without seasonality, the 6mth and 12mth averages should be roughly the same. If you have some seasonality, you might want to consider the performance from the same time period last year. Once you have a baseline, consider a reasonable growth percentage - if your averages show a general growth trend of 5% each month, this will give you a good starting point for your goal! Consider the xfactors: will you have any technology updates in the near future? Any new products planning to be launched soon? Will any services that will be removed? ROBIN: Just one thought to add here. 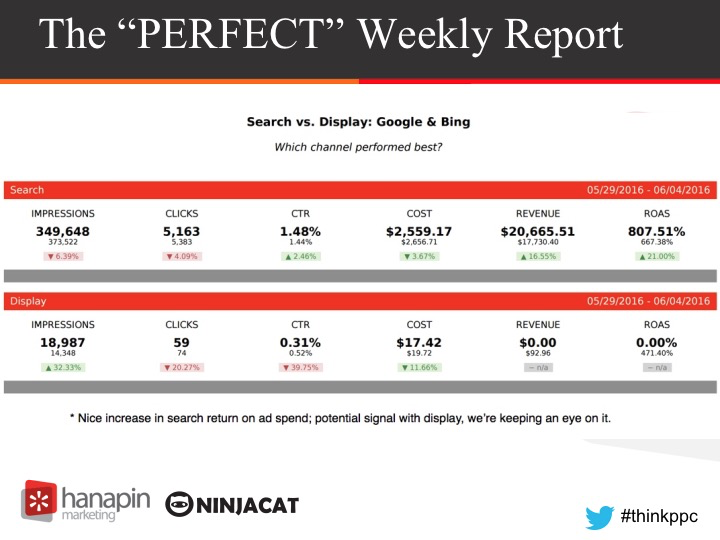 So often we work with agencies who week after week are on the quest for “green upward arrows” across all their KPIs… a better CTR, decreased CPA, increased impression share… . The fact of the matter is that’s next to impossible. If there are any athletes out there, that’s like saying every time you go out for a swim/bike/run - you’re going to beat your last time. Aint gonna happen! Even Michael Phelps can’t do that. What Alka is suggesting gets you out of that game and into a better one of setting meaningful - and achievable - goals with your clients. ALKA: That is exactly what I hope is a key takeaway from this webinar, goals drive everyone to march in the same direction and they make partner and client relations a lot smoother. So let’s move into the next stage of setting up your reports - Now that our report has a purpose, let’s get into how to chop and splice your data. Here is another truth, no one wants to just see an aggregate report. While top line measurements are useful as a digestible summary, they are not very actionable. It is in your best interest to cut up data! By segmenting your data you will be able to identify red flags or growth opportunities. The first option we are going to look at is splitting your performance by platform. 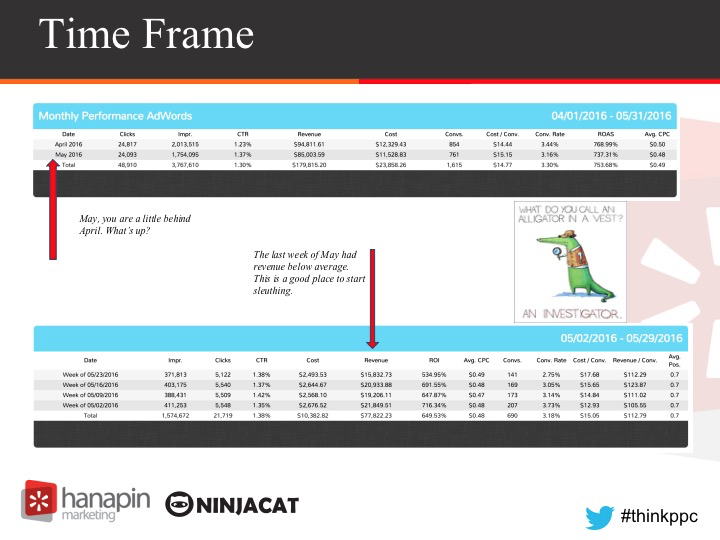 For example, splitting your data into Google performance vs Bing vs some of the new social media platforms. ROBIN: At the least, you will want to split your platforms and hone in on which venue is giving you the best return on investment. If you work at an agency, you know that Google, Bing, Yahoo/Gemini and the social platforms all perform very differently from each other AND perform differently from client to client. 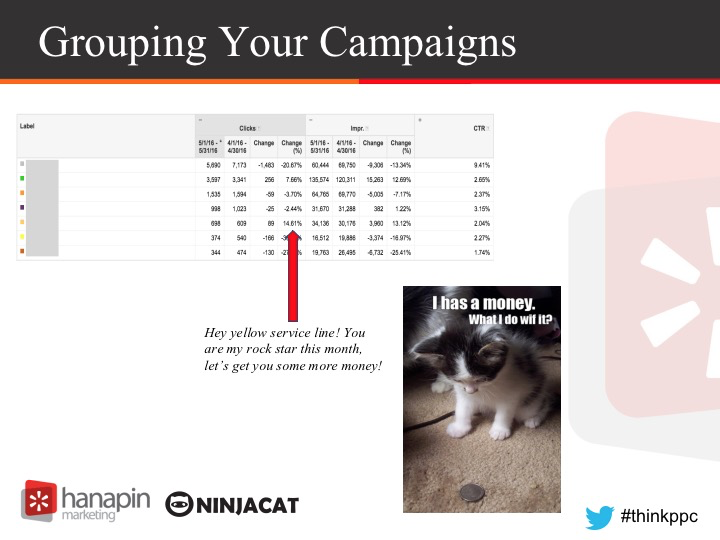 If your data is being presented together, you will not be able to optimize some campaigns over others. 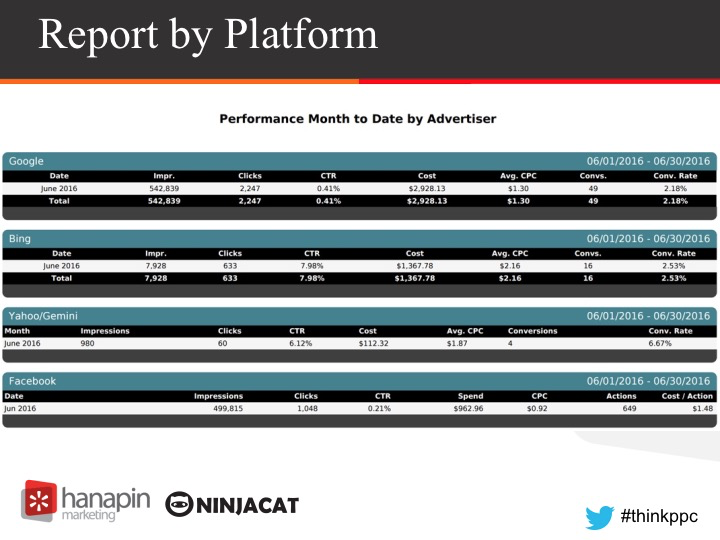 Included on this slide is an example of report that runs every Friday, pulling data in via APIs to Google, Bing, Yahoo/Gemini and Facebook, and depicting month-to-date performance across each platform. ALKA: Let’s move to the next segmenting option…. Your client's might have a search only account, or perhaps they are dipping their toes in the world of search, display and search with display. If you are in the latter, you will want to show data that splits data up by advertising network. 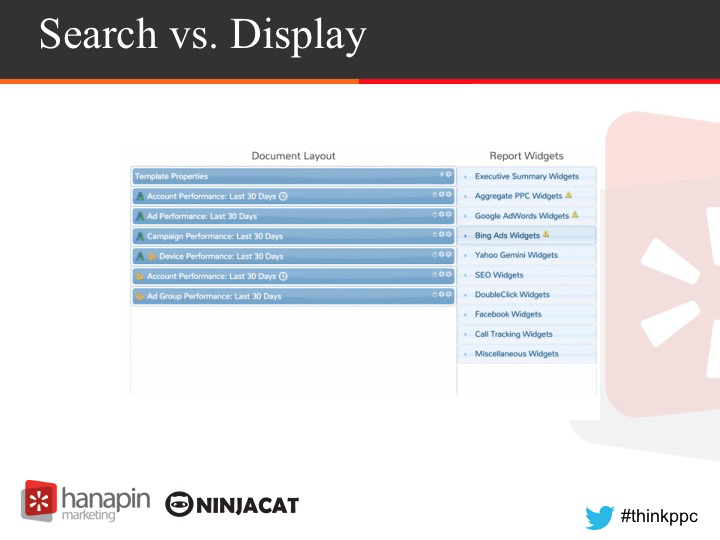 Splitting search and display traffic is important because the intention, cost and results from these networks are very different and require different strategies. By splitting the data for search and display, you can assess how each is performing and determine if you need a different budget for each network. If you have some campaigns that are running in Search with Display Select Network since Google’s magical algorithm is determining where your ads will showing based on what they think will be the most successful, so you won’t be able to segment the data but you can at least have this data in a different group to keep an eye on the spend and conversion rates - insider tip: these campaigns can burn through budgets so make sure you have daily spending limits set! ROBIN: Yes - definitely a good tip to have your daily spending limits set. 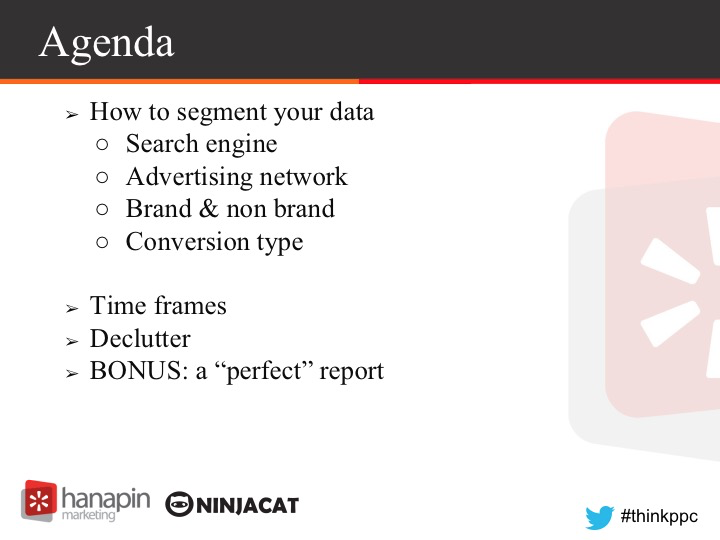 With NinjaCat - our AdWords, Bing and Yahoo/Gemini widgets provide filters that make it really simple to segment your data by advertising network. In fact you can filter on search, display, shopping, youtube search and youtube video networks. 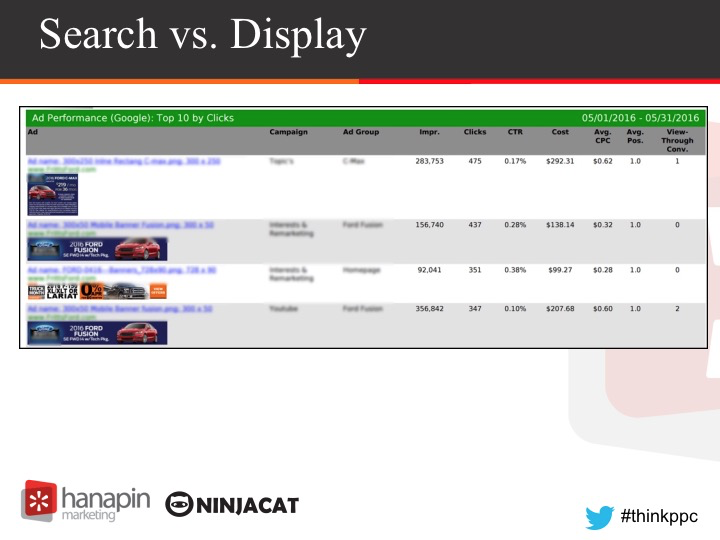 ROBIN: And here’s an example of filtering by the display network to present the top display ads for a car dealership. 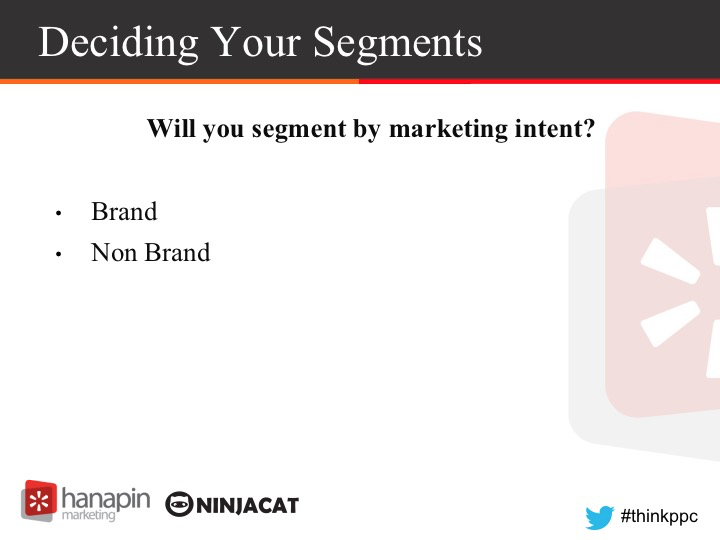 ALKA: The next segmenting option involves marketing intent. If your client is not running brand campaigns, you will not have to worry about this topic. But here is some food for thought - Brand is often thought to cannibalize organic efforts and this is a topic that is discussed in high frequency on PPCHero and at Hanapin, but the truth is that Brand is a critical part of the paid search arsenal. Brand searches are high intent (i.e. closer to converting) and have a high ROAS, especially since the CPCs are lower for brand terms. Additionally, the success and volume of brand campaigns will overinflate the averages for the account and this will give you a false sense of accomplishment. I don’t mean to be a downer, but your non brand campaigns will need more strategic planning. 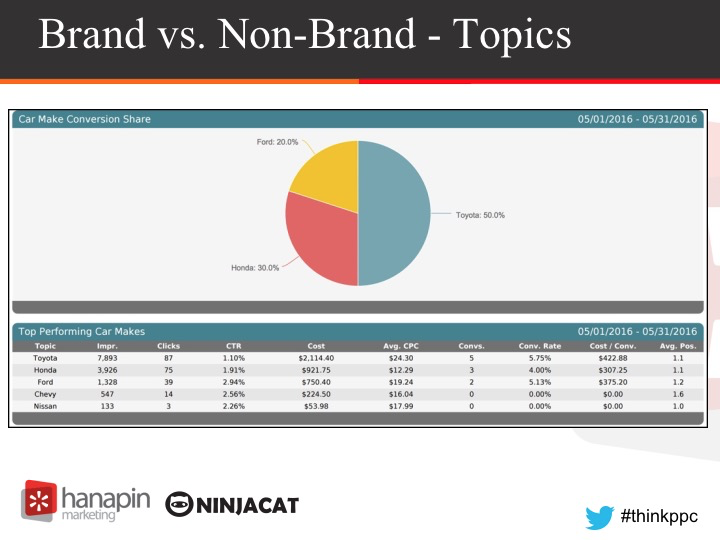 My rant is illustrating a point - you can see that the math for the performance metrics of brand vs non brand campaigns is very unique, so it is important that these campaigns are reported separately. ROBIN: For sure - it’s absolutely necessary when working with clients who have a strong brand presence to break out non-brand from brand. 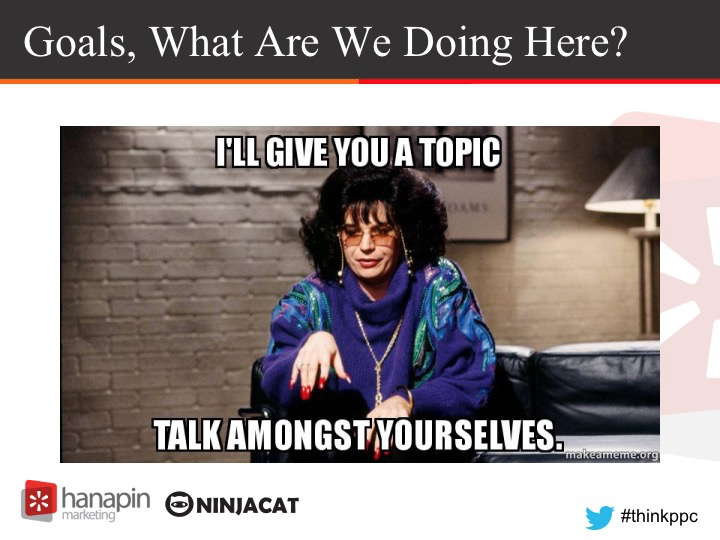 At NinjaCat there are a couple ways we can help you do this. One is by using campaign filters. The example I’m sharing here is from large well known retailer both in the US and Canada. 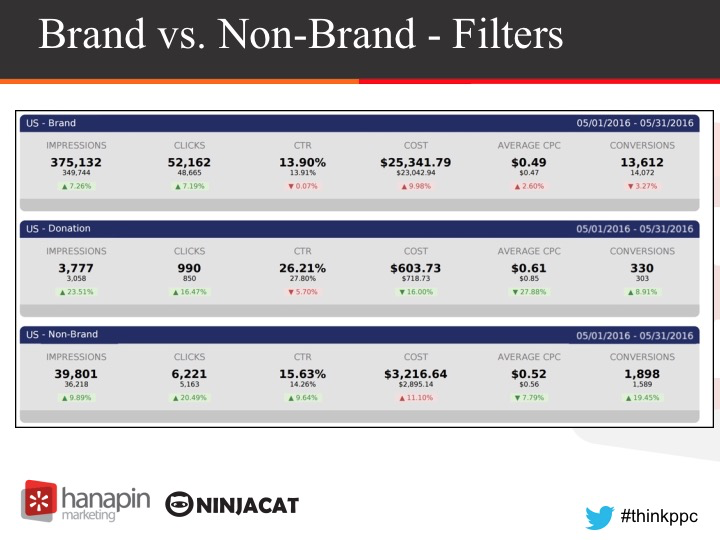 So in this example we’re actually segmenting both by country (US vs. Canada) as well as Brand, Donation and Non-Brand. We’re using an executive summary widget which can aggregate data across Bing and Google and provide a time period comparison such as month over month or week over week. ROBIN: The second approach is to use something we call topics. Topics are an easy way to bundle performance metrics across multiple PPC and call tracking providers for similar products, markets, regions, etc. To enable topic tracking you just add a tag to the end of your campaign and/or AdGroup names. 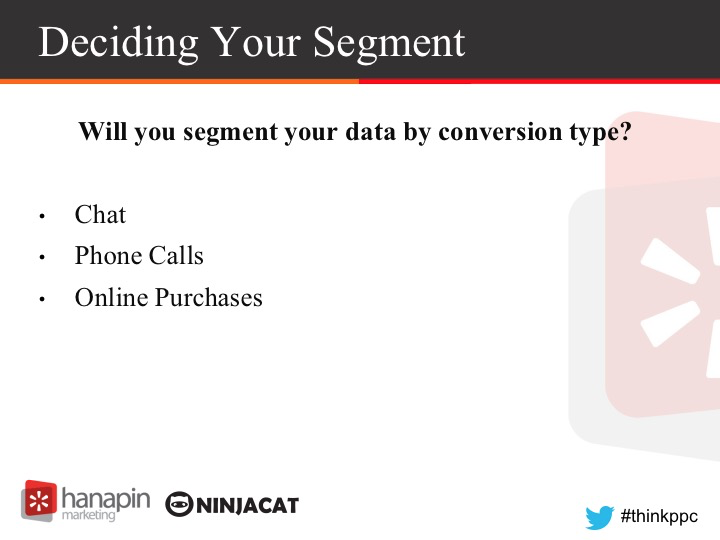 ALKA: Lastly, another way to segment your data is to consider the WAY a customer is converting. For lead generation clients a conversion could be a form fill, or a video view, or a newsletter sign up, or a white paper download or a phone call or a chat conversation. For ecommerce clients, a conversion could be a purchase made on the phone, a purchase made on the site or a purchase made in store after extensive online research. The last one of those examples is hard to track, but retailers are trying really hard to find a way to track that purchasing path from online research to brick and mortar store. I have heard of client's that use unique coupon codes generated after a customer visits the website or client's that build a robust customer loyalty program with account cards that are used at the time of purchase. A great example of this is Starbucks and their purchase app which tracks purchases online through the app and in store. ROBIN: Right Alka… the way a customer is converting is definitely important, perhaps you will see a trend that shows that when a customer calls and speaks to someone in your store about a product, they are more likely to buy with a higher average order value, this will let you know that you need to invest more in phone staff AND have ads that better call out the phone number. 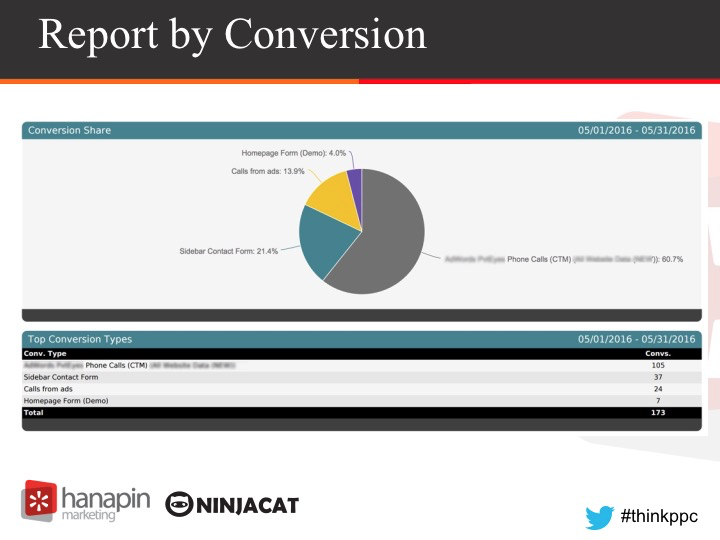 Depicted on this slide is our Conversion Type widget - which allows you to show a pie chart based on conversions, revenue, cost, clicks or impressions. ALKA: My poor dog Taj is getting pretty bored of all this planning. Unfortunately for Taj I have one more point to make about segmenting your data. 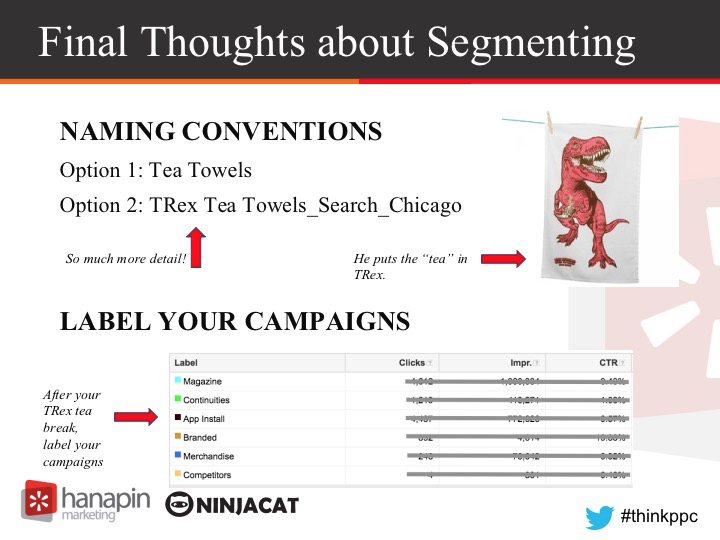 ALKA: 2 more general points about segmenting your data, the first is that NinjaCat and other reporting aggregate tools make life a lot easier when putting together reports, otherwise you will have to roll up your sleeves and build a report in Excel. But if you don’t have access to an aggregate reporting tool, there is hope! 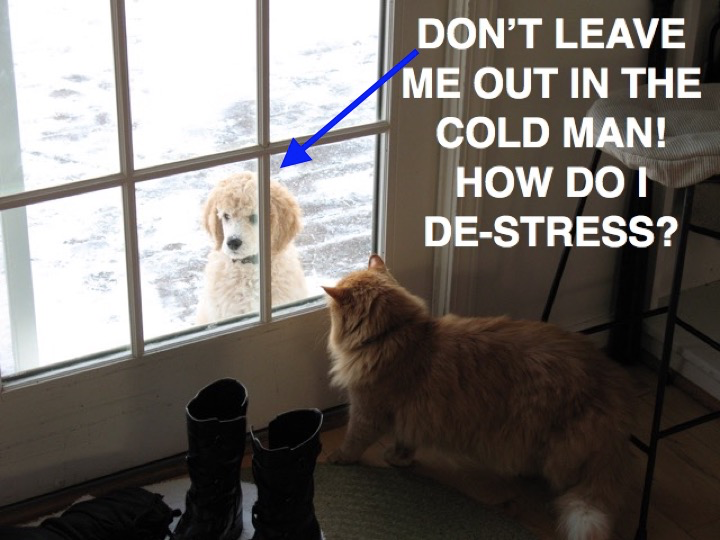 You will need some comfort in creating and manipulating pivot tables. And if you are really advance, some skill in creating macros and other automation tools. Another tip that will make your life easier is to set up labels in AdWords AND another idea is to have better naming conventions for your campaigns and ads. This way, you can pull a dimensions report that segments your reports into labels or you can set up filters in the interface. The 2nd point is that your report is going to likely have a hybrid of different segmenting models but as a last tip, avoid over segmenting in reports that you see on a regular basis - have a purpose for each level of segmenting eg. a performance report of “branded google chats” doesn’t need to be pulled on a weekly basis, perhaps you only need to see that on a monthly basis. 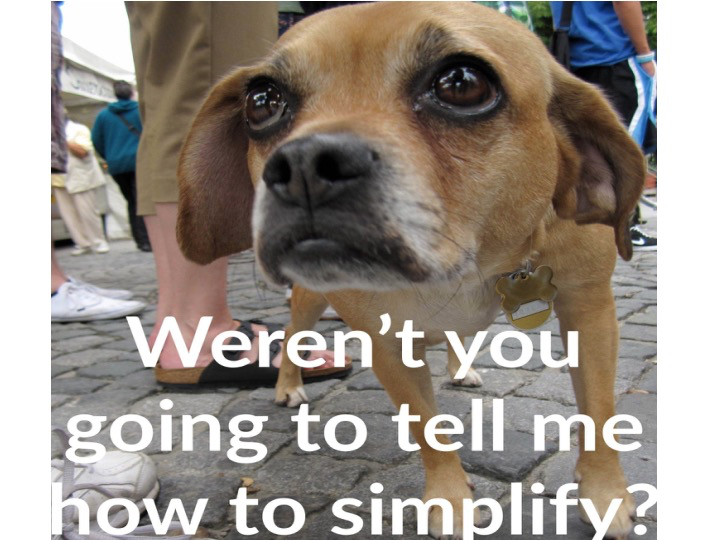 Ask yourself why you need to have an additional layer of segmenting. ALKA: Alright, let’s dive into the idea of time ranges for your reports. Reports need a consistent time frame to avoid confusion when another user is looking at the data and hoping to compare performance points. Looking at data on a daily basis is usually only good for dayparting analysis. But looking clicks and impressions per month for the last 12 months or more is overwhelming. 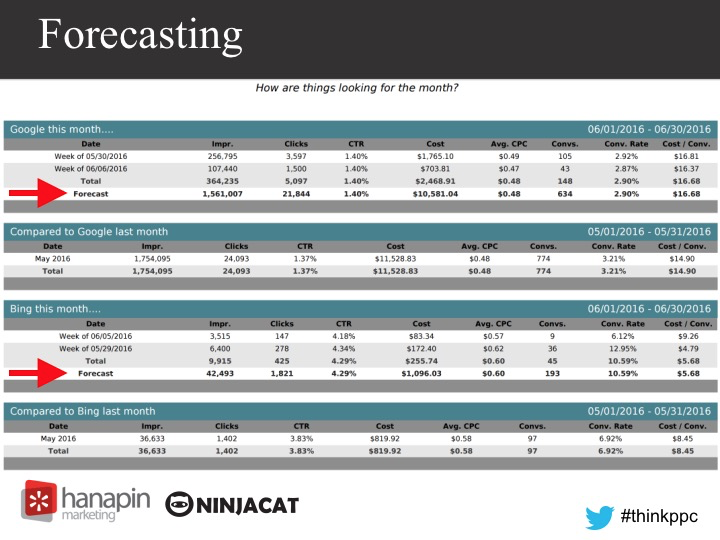 A rolling report that shows the last 4 – 6 weeks of data on a week to week basis and is enough to give a window into current performance trends and will give you a starting point for where to investigate if numbers are misbehaving. 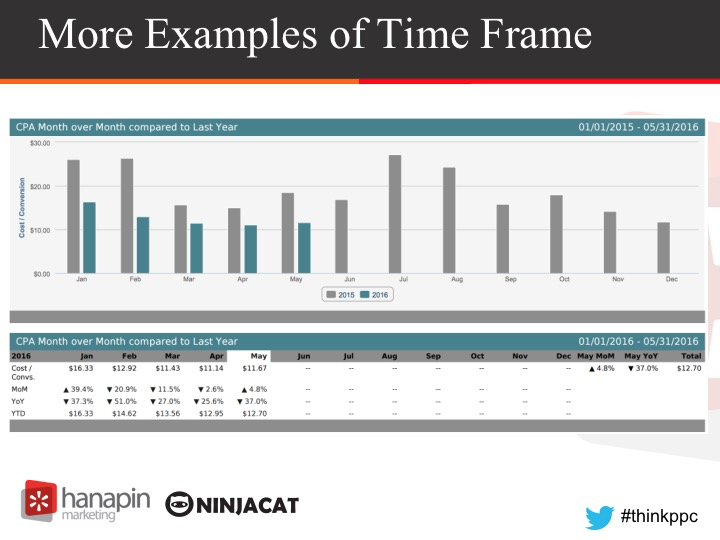 ROBIN: For a more historic view, comparing the current month to the same month last year - as this chart does - will help a client understand the growth or decline of their account year over year. If there are external factors that are suppressing the expansion of their business from last year to this year, a YoY view can help visualize the impact to the bottom line. 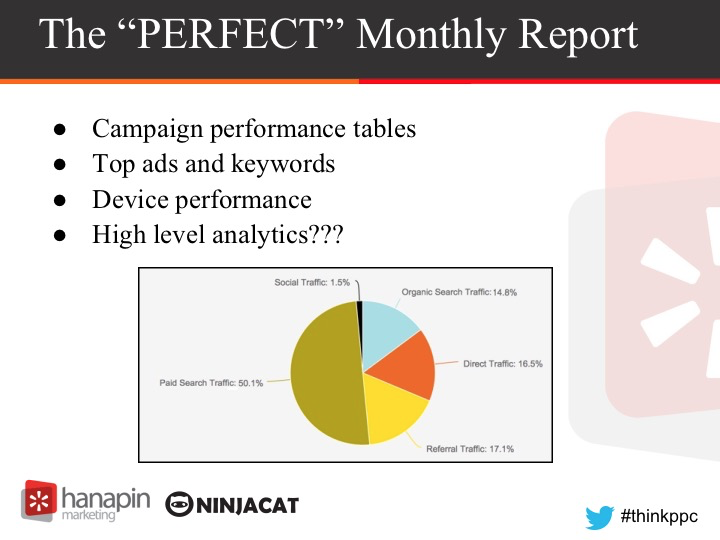 This chart was produced using NinjaCat’s monthly trending widget which allows you to chart key metrics such as cost, CTR, CPC, revenue, conversions, etc. This particular example is looking at cost per acquisition in aggregate across Google and Bing. ALKA: The next topic regarding time frames is forecasting! 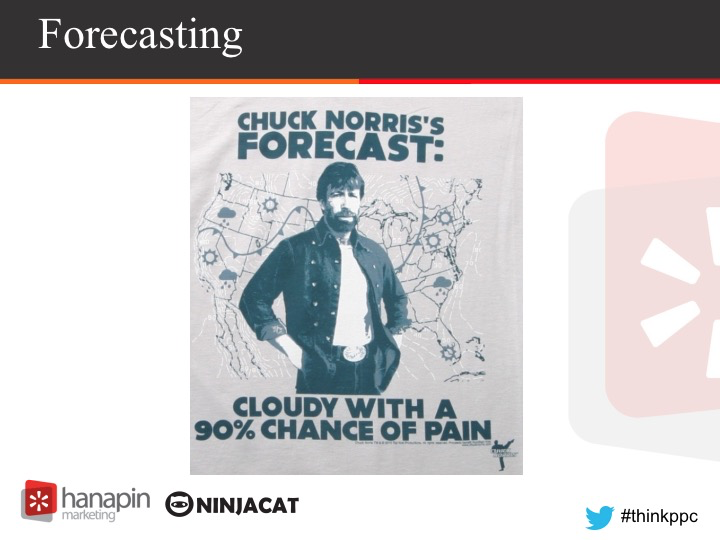 Forecasting can be a little risky because it might not take into outlier events that cause traffic to spike or dip, but most often forecasts can help you predict what the key metrics will reach at the end of the month. This can help steer away from accidental overspending and prompt good conversations about reassigning predicted unused spend to other opportunities. 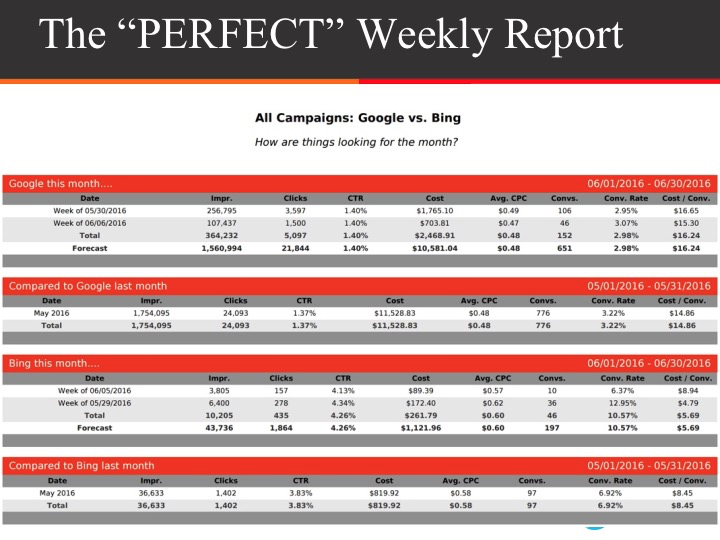 ROBIN: Yup - and here’s an example showing month-to-date performance for both Google and Bing - projecting key metrics through to the end of the month and comparing to the prior month. ROBIN: This was accomplished literally with the click of a button. 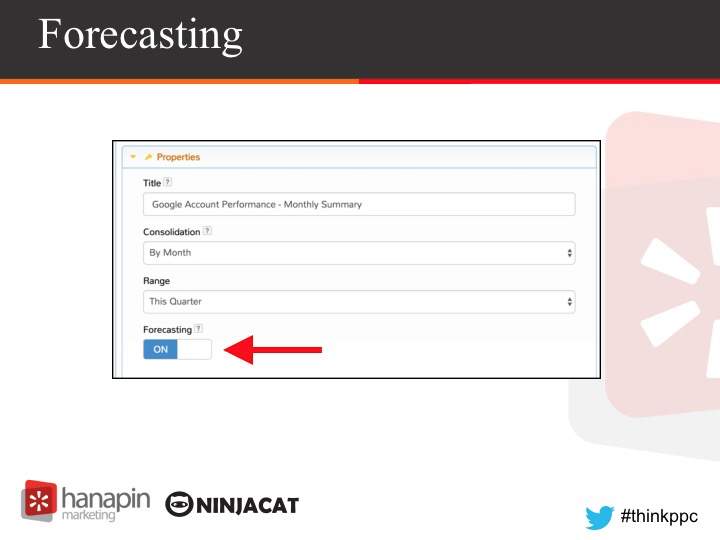 Both our account and single campaign performance widgets offer an option to enable forecasting - as depicted on this slide. 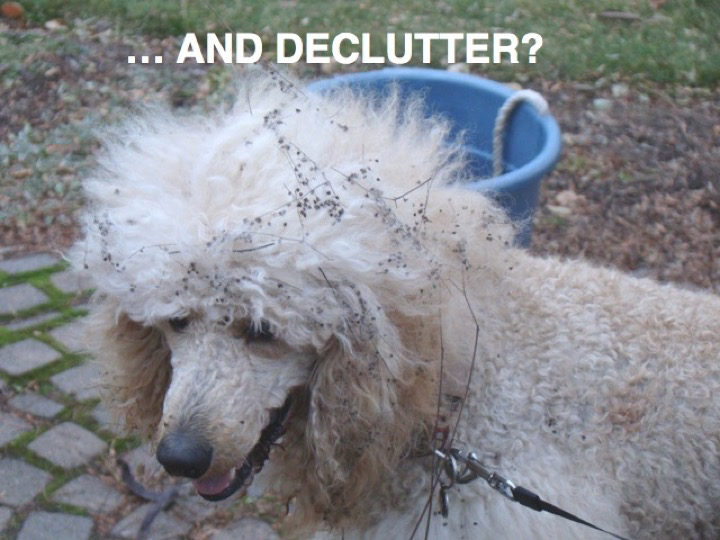 ROBIN: … and figuring out ways to get cut the clutter from your reports! -Does this data change frequently and need to be monitored on a weekly basis? or is it pretty similar from week to week? -Do I look at or talk about this data each week? Is it something that comes up frequently in meetings? -(harder to answer) If I see a wild swing in the numbers, should I make a change immediately? This is a controversial topic because some would argue that making the decision to pause a keyword or ad or making bid changes on only 7 days of data is reactionary and more harmful to your performance. 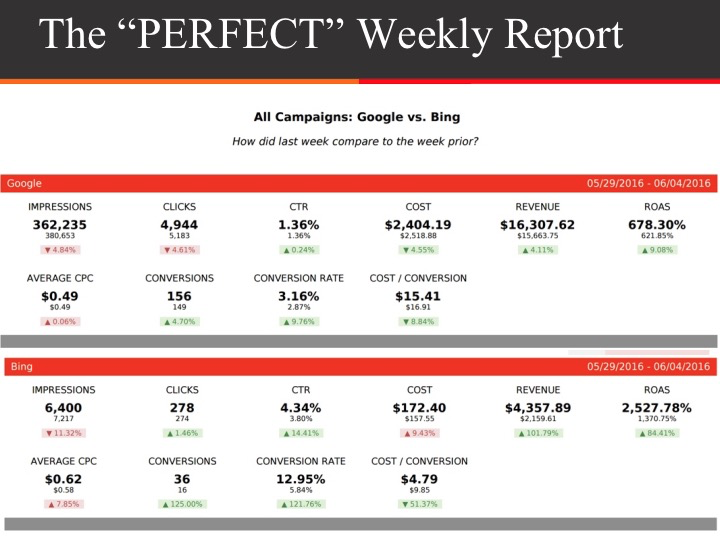 I recently heard of a client that wanted to see the top and bottom 30 keywords on a weekly basis and wanted to discuss the metrics on the weekly call. The account manager had a level of patience that few possess. Eventually the client realized that spending time in a weekly call fretting over keywords that the account manager was going to correct anyways, was a waste of valuable and expensive resource time. 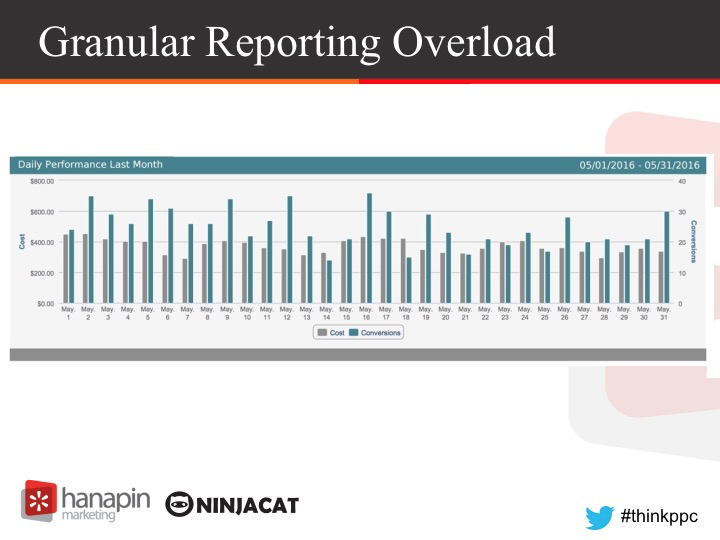 ROBIN: Eventually all reports need to be edited if you suspect there are tables or graphs you could do without, consider moving them to a monthly or quarterly report and see if you can live without seeing that data on a weekly basis. In the case of a keyword report, perhaps it is better to schedule a monthly search query report to identify words to add or remove, or what bid adjustments you want to recommend. ALKA: Which brings me to the next tip for gaining some sanity in your reporting - organizing your campaigns. If you have a client with clear product lines or geographic markets, make sure you take the time to group your client’s campaigns. In some reporting tools it is as simple as creating a filter, and this is where labeling your campaigns or having clear and informative campaign names will help! For example, a client of ours has 7 different services that they provide in 7 different markets and grouping the data into service lines, we were able to see that 1 of the service lines was getting a lot more conversions week over week. This lead to the decision to take extract some budget from lower performing service lines and move them into the suddenly popular services lines. 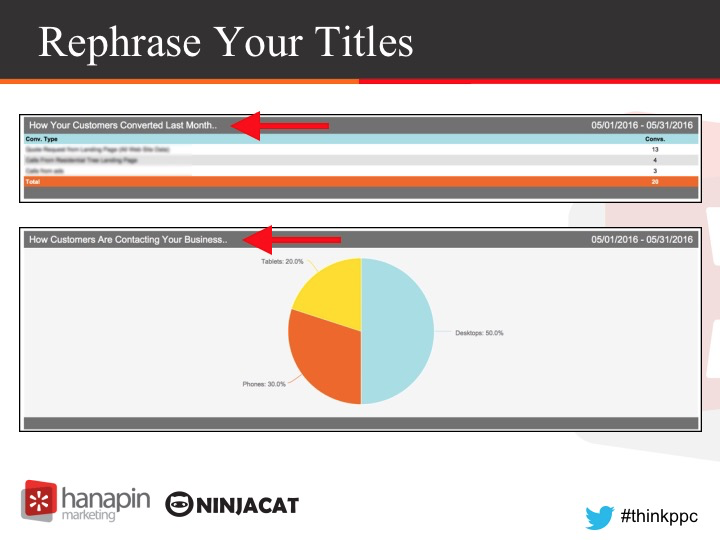 ROBIN: Another great idea, that I actually garnered from a new client I was onboarding is to pay attention to the titles on your charts and tables. Most of the time we are so focused on getting the charts and tables right, we 100% forget about the titles. They’re the last thing we think about, when in fact they’re probably the BEST tool we have to tell our data story. 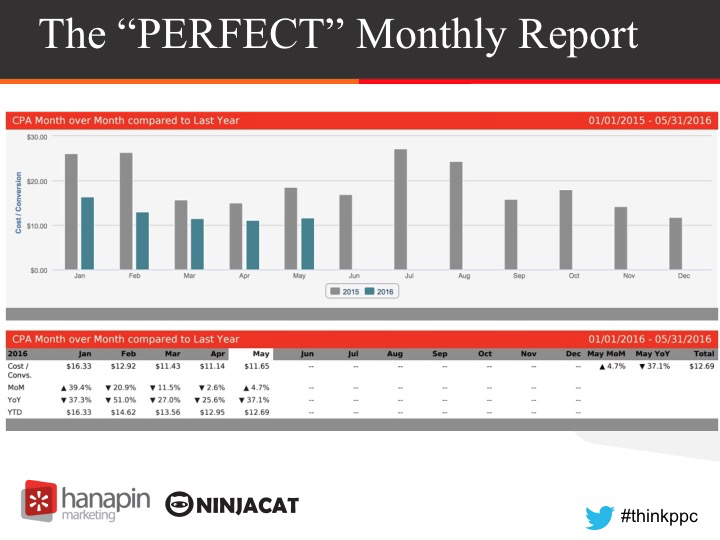 ROBIN: Adding notes and analysis to your reports - monthly reports in particular - is also important because the numbers really do not speak for themselves - they require your interpretation. ROBIN: At long last - let’s get to the “Purrrrrrrfect” report. That’s some subtle marketing “raght there” folks! 2.Drive actionable decisions. Keyword here is actionable. Our CEO is constantly reminding us of the importance to distinguish signals from noise. Signals are actionable. Noise impedes smart actions. 3.Prove your value as an agency to your clients. It’s your prime time to shine and not only explain results, but all the effort you put into achieving those results. ALKA: We’re going to focus on a weekly report which would open with a week over week high level comparison of platforms. In this example, rather than cluttering each table title, subheadings are utilized to help the reader quickly discern what “slice and dice” they’re looking at. 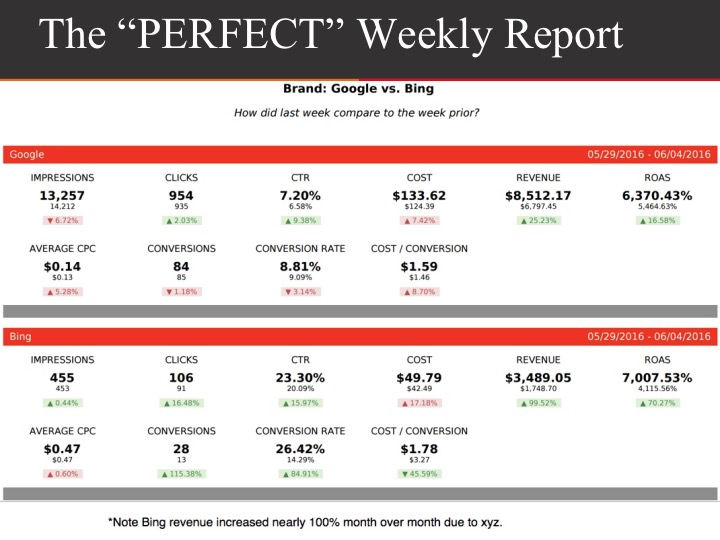 It didn’t fit on this slide but a short comment at the bottom of the Bing table points out the reason for the significant jump in Bing conversions and corresponding revenue. Most reports open with a view of the two big platforms bc this is where a lot of paid search budget is going, so people want to know off the bat what is going on. ALKA: This is followed by a look at performance by network, with another short comment, appropriate for a weekly report. Some client's would even break this down into Google Search, Google Display, Bing Search and Bing Display but for the purposes of this webinar we wanted to keep it short and sweet. 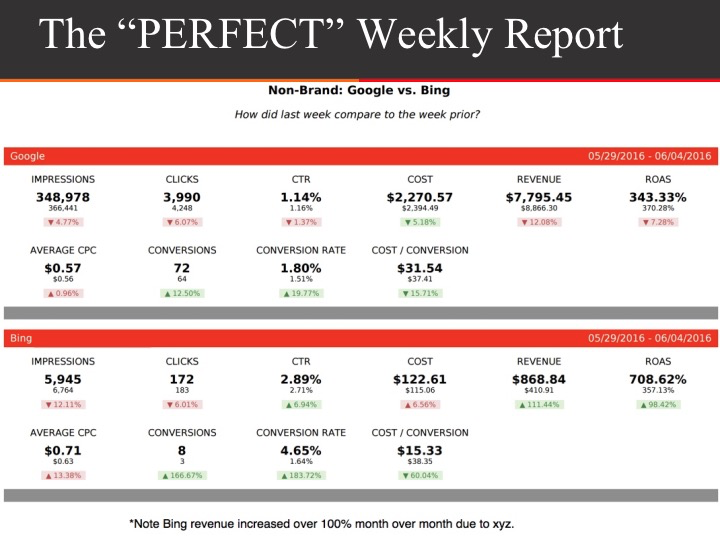 ALKA: Then we filter down to BRAND - again providing a week over week snapshot across Google and Bing. ALKA: … followed by Non-Brand. Having Brand and Non Brand back to back helps us toggle back and forth to see if either of these campaign types needs extra attention. ALKA: Next we have a visual break up of the tables of data, here is a nice visual depiction of the top converting non-brand campaigns, segmented by Google and Bing. Non Branded specifically because for this client Brand is a big and successful campaigns, and it dominates the review of the campaigns. They are pretty confident in their brand campaign, their non brand campaigns not so much. ALKA: And the top revenue producing Shopping campaigns for the week. Note the use of charts rather than tables. In the monthly report, I would include the tables as well. 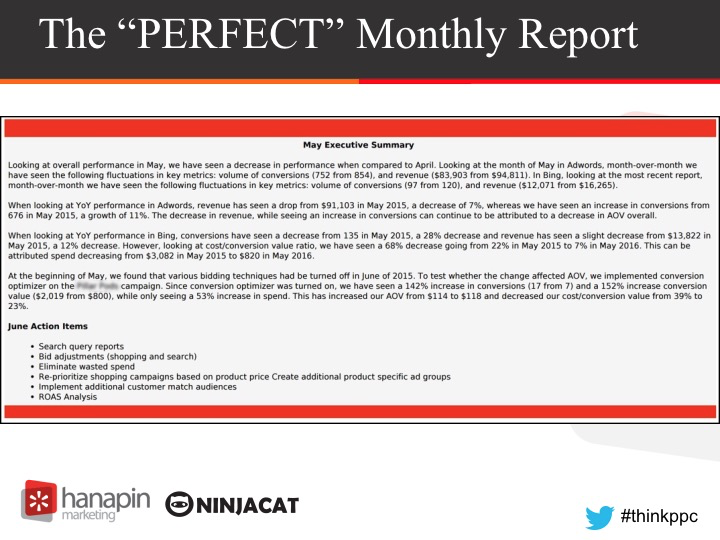 ALKA: Here is a review of this month compared to last month with a Forecast thrown in so we can make sure that we are close to our goals. ROBIN: Shifting gears to a monthly report, since we’re short on time I’m just going to suggest some potential tweaks and add-ons. Whereas notes in a weekly report should be short and probably sparse, opening your monthly reports with detailed notes and analysis gives you an opportunity to shine and as I mentioned earlier, demonstrate your partnership with your client and everything you’re doing to promote their business. ROBIN: Obviously - all the week-over week summaries Alka discussed should be tweaked to compare month-over month. Another thing you might consider adding is a month-over-month and year-over-year comparison. -the corresponding tables to the campaign pie charts included in the weekly report, expanding to top 10 campaigns for the month. -We’re also increasingly seeing PPC agencies include a taste of analytics information in their monthly reports, such as session a by channel. Although strong word of caution - keep it high level so you don’t find yourself in a lot of “extra conversations” ! 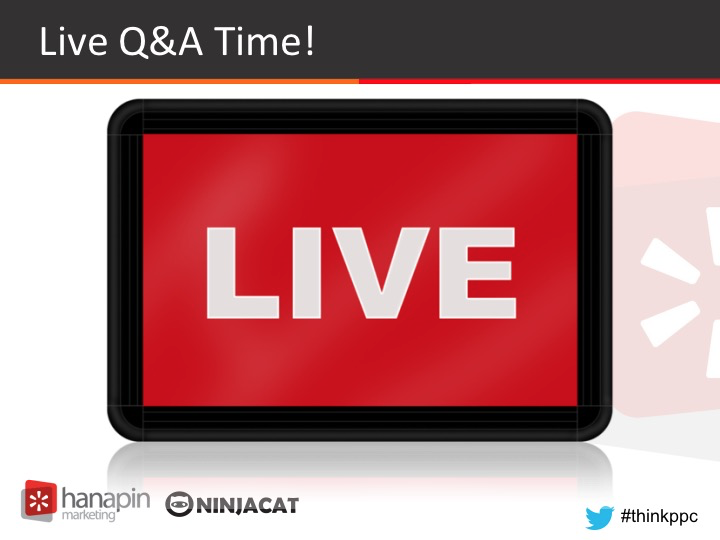 ALKA: We have come to the conclusion of our webinar today! Robin and I had a lot of great conversations about the philosophy of good reporting and we hope our presentation today was able to get you excited about your own reports. As a thank you to those who made it through to the end of our webinar, we have some offers! A poll is going to appear on your screen, just hit the offer that you like the most. 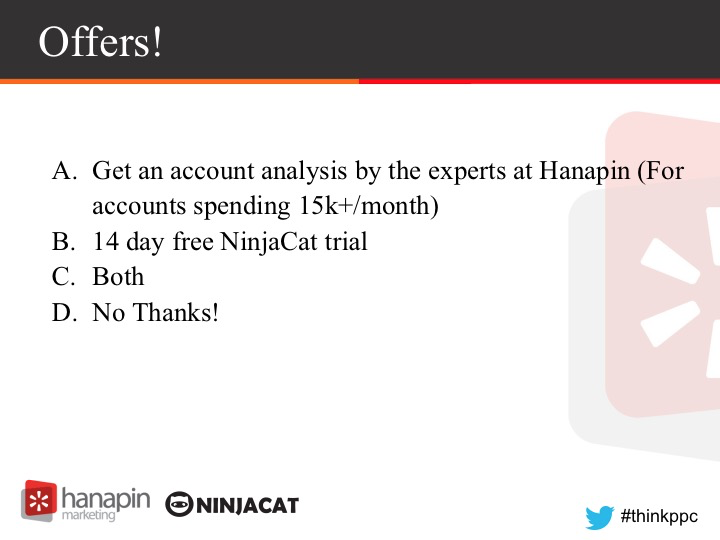 First off, Hanapin is offering an account analysys of your account by our team of experts. 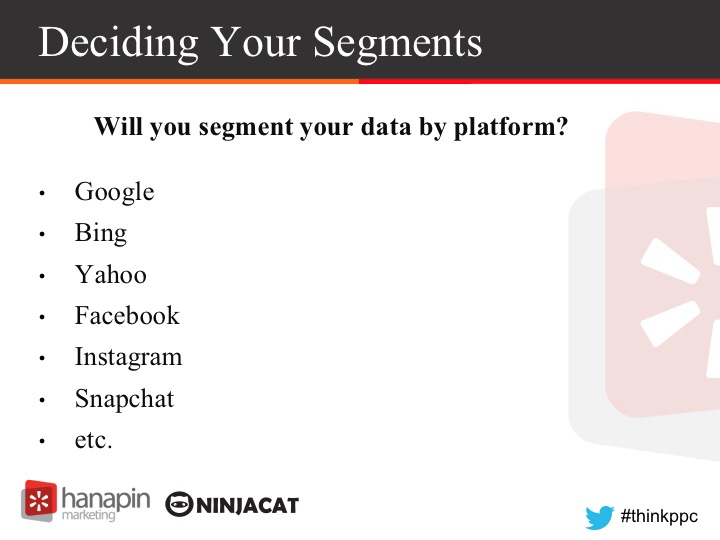 ROBIN: 14 day free NinjaCat trial, during which one of our experts will get you connected to Google, Bing, Facebook .. whatever providers you utilize… we also integrate with several 3rd party call tracking providers. Once connected, you tell us your toughest client to report on and we’ll work with you to create the “perfect report” for that client. If you’re interested in call tracking, during the trial we can also show you NinjaTrack - our purpose-built-for-agencies call tracking solution. -Should I have all tables and graphs? Or include a lot of notes/analysis? Def includes notes/analysis and tell your story. -What is the difference between a Lead Gen and an eComm report? 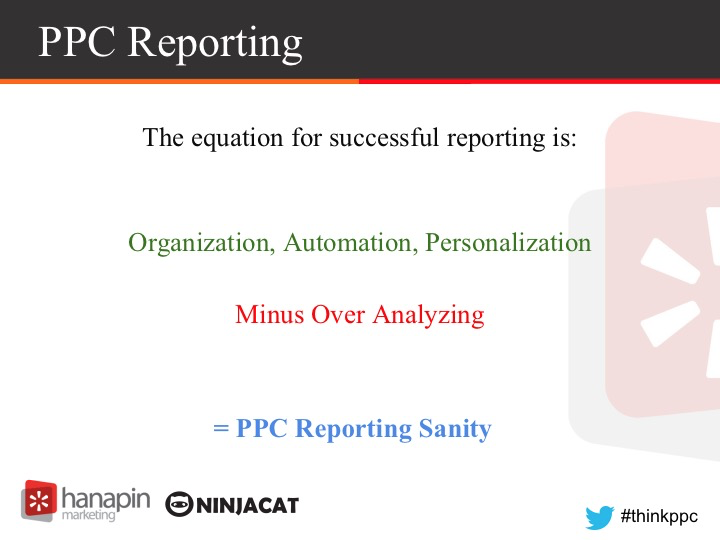 -How do I get a client that has too many reports to commit to going to less reporting? -Can’t make decisions on short timeframes of data.